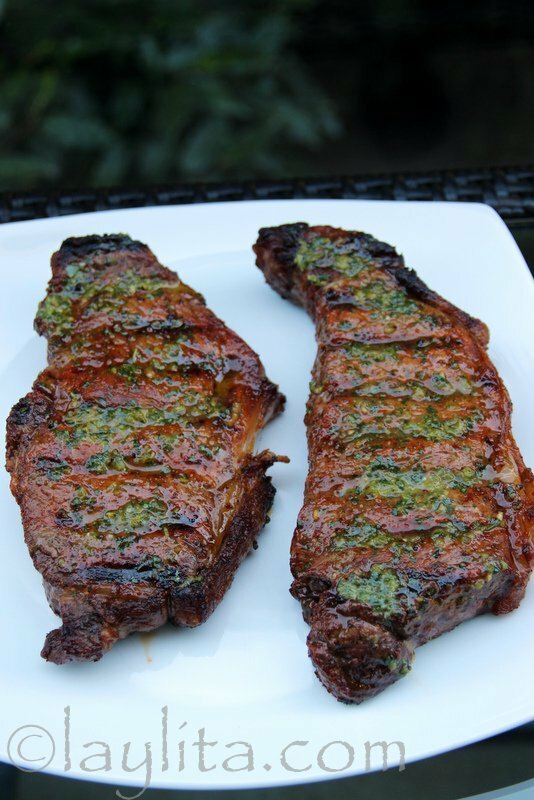 This is an easy and flavorful recipe for grilled steaks marinated in a spicy achiote beer mix. The steaks are basted with a spicy jalapeño cilantro salsa while grilling and served topped with the same salsa. 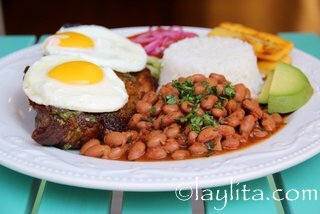 I love love love bistec asado or grilled steaks – that’s where the Texan side comes out. However, we aren’t huge meat eaters in our family and probably wouldn’t enjoy as much if we ate steak every day. We tend to eat more seafood and chicken than beef. However, every now and then I really need to eat a big juicy steak – and my favorite way to eat a steak is grilled and topped with something spicy. 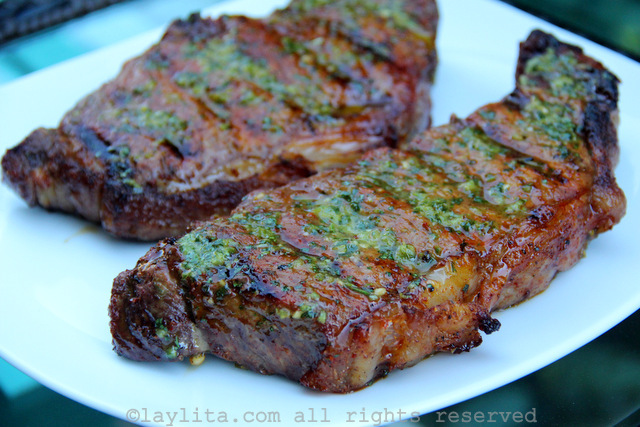 Easy and delicious recipe for grilled steaks marinated in a spicy beer mix, served topped with jalapeño cilantro salsa. Mix the marinade spices with the beer and lemon juice. 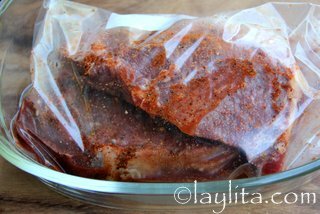 Place the steaks in a large sealable plastic bag or in a bowl and cover with the achiote beer marinade. Let marinate for at least 2 hours, overnight is ideal. 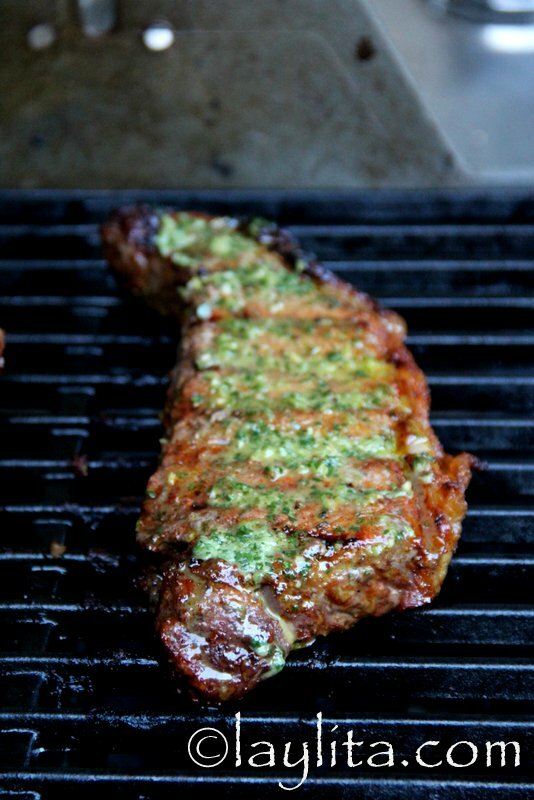 Place the steaks on a hot grill, use some of the jalapeño cilantro sauce to baste the steaks while they’re grilling. 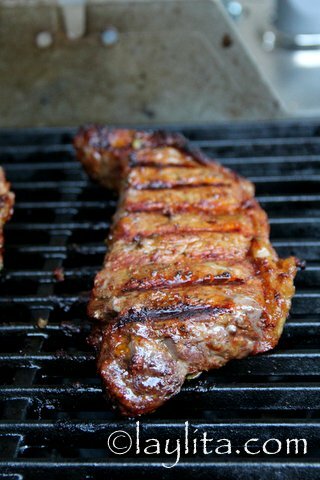 Cook the steaks to desired doneness, will vary from one grill to another and also based on the thickness and cut of meat. Let the steaks rest for 3 to 5 minutes on a warm plate before serving. Serve topped with jalapeño cilantro sauce and with your choice of side dishes. Asados or barbeque parties are very common in Ecuador, especially on the weekends or holidays. 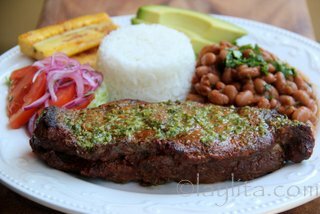 And yes, I know that you can just add some salt to a good steak, throw it on a hot grill and you have deliciousness….but, as a good Ecuadorian I love to marinate my steak (bistec) and serve it with tasty sauces. And of course, as a good Ecuadorian I have to use achiote or annatto for almost everything. 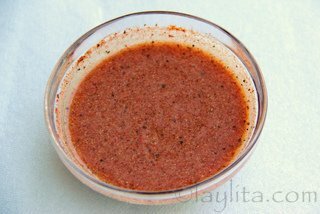 It’s easier to find ground achiote these days, but in case you can’t find it, use can use paprika as a replacement. I love using beer as a marinade ingredient; it works well for steaks and beef, but also for chicken, pork and even seafood. 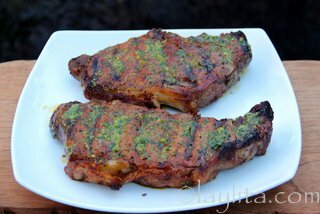 I also used garlic powder, even though I prefer the taste of fresh garlic, because I didn’t want extra bits of the garlic sticking to the steak and burning on the grill. 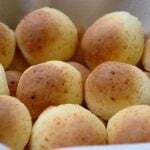 Feel free to replace the garlic powder with fresh garlic. 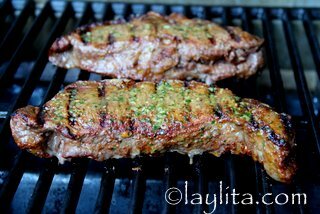 I used New York strip steaks, I just love their flavor and they’re so easy to grill – but this marinade would also work great with ribeye and tenderloin. 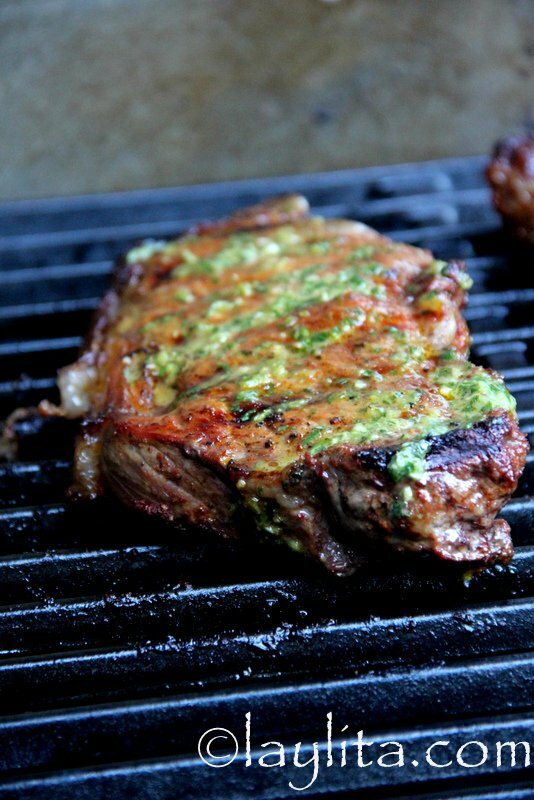 The jalapeño cilantro sauce is a must-have for these beer marinated grilled steaks. 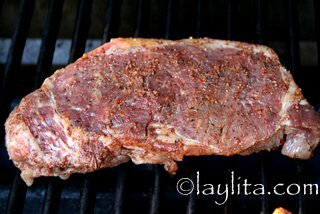 I use a small amount for basting the steaks while they are on the grill and then serve the rest with the meat. 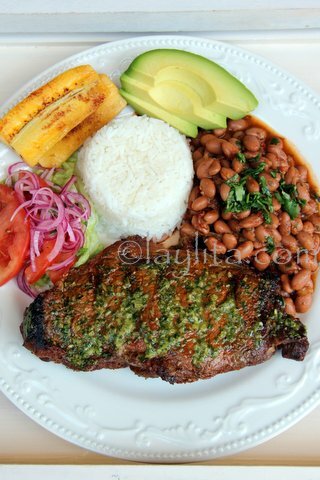 You can serve the steaks with your choice of side dishes, but I highly recommend it with menestra de porotos or bean stew and Ecuadorian style rice. I also love adding some tomato and onion curtido on the side. Fried (or grilled) ripe plantain slices are also a great side dish. 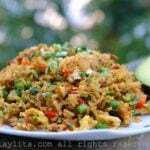 As a good Serrana (from the Andean Highlands) I love to serve everything with avocado slices. 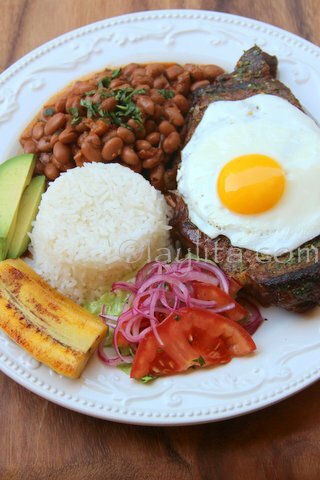 And if you are really super hungry then add a fried egg on top of the grilled steak for a churrasco style meal. 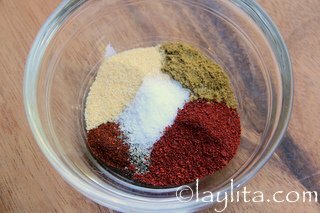 Hi Natalie – I’ve tried both cayenne and chipotle powder before, both work great, anything that will give a little bit of heat will work. The last time we were in Ecuador, I was able to bring home achiote from the market. That bring said, it is the bottled achiote (like oil). How would I use the bottled stuff instead of the powder??? Would the measurements be the same or more or less??? I’ve noticed the bottled one has less flavor compared to the powdered sazon that the Badia brand sells. Thanks!!! Hi Alicia – Yes, the concentration of oil infused achiote is different (and even varies from one brand or person who makes it to another). For this recipe add a couple of tablespoons to the marinade and taste to see if you like the flavor, then add more if it needs it.